Long runs cleanse the body and the soul. Well, last week was good, I made all my runs and felt pretty good. I had a weekly mileage of 25 miles, and ran slightly over it with 25.5. Sunday was my long run and I had a blast. I slept in a bit, felt good just to ignore the clock, got going around 08:00 am. It was about 75 degrees with humidity around 80%, luckily it was overcast or I would have been road kill. I got back to the house completely soaked, none of the dry fabrics work when the humidity is above 60%. Its days like this that make you, I mean when you run in weather like this it make you a better runner both physically and mentally. I think that training yourself for the mental battles is 50% of the race, you have to put in your time in, on the road and in your head. My knees are a little sore and had run down a bunch of hills too hard and I am paying for it. This week I am going to take it easy on the hills, I am much too early in my training for an injury, I got to play it safe. This week and have a cross day for Mon, 3 on Tues, 6 on Wed, 3 on Thurs, off on Fri, 6 on Sat and 11 on Sunday. So a pretty good week, this is my biggest week in quite some time, giving me 29 for the week. I think I might need to swap Saturday and Sunday as I think I will have to spend Sunday morning working from home, and with the heat the morning is the best/only time to do longer runs. During my long runs I have time to think. That sounds a little funny, time to think, well what the hell am I doing all week… What I mean to say is I have a few hours to spend thinking of my family, my relationship with my wife, and hit rewind and review. I try to work though the questions, am I the best farther, husband and colleague I can be, am I giving 100%. Boy, these are hard questions to answer, but worth asking. Life is what you make if it, so don’t cheat it. I have been on vacation for the last two weeks and now its time to settle down and start training. I am going to follow a slightly modified version of Hal Higdon’s Intermediate I training plan. I needed to make a few small adjustments because of my schedule, I flipped Saturday for Sunday 2 times because I know I have plans that will not allow me to do long run on Sunday. This is my third week, and I will have a weekly mileage total of 25, I have a 3 on Tues, a 5 on Wed, a 3 on Thurs, off on Fri, a 5 on Sat and a 9 on Sunday. I have been a little behind on the schedule because of vacation and triathlon training, but I am now switching focus to marathon. I have one Olympic (1.5K Swim, 42K Bike, 10K Run) triathlon left on the schedule on Sept 15, the Tugaloo on Lake Hartwell, so I have to keep the swim and bike strong until then. My training schedule has Monday as a cross day and I will try to get on the bike and get a good ride in. I plan on swimming at Johnson Park at lunch 3 to 4 times a week during the training but I will take it down a notch and really work on technique. So that’s it for now, more too come in the few days as I make my way into more miles. Well, I got to spend some time with my Dad this past weekend. My wife and kids are still up north on vacation, so I decided to drive out to my Dad's house on Lake Murry in South Carolina and hang out. I got to do a big brick on Saturday, I got in the water and swam for 30 minutes, somewhere around .8 mile swim while Dad followed in the boat. Then I hit the bike for 24 miles ride that was pretty flat just a few rollers. After the bike I ran approx 3 miles, shorter than the normal 6, but it was getting hot and I did not want to be spent for the day. So, the swim went swimmingly, the lake water is very murky, you can just see your finger tips. I was able to keep my stroke going for all but 2 or 3 times where I would roll over and back stroke for a few seconds to take a break and see where I was and where my Dad was. I defiantly felt the best I have in an open murky swim, I felt calm and swam straight. The race was a blast, and I can’t wait for my next one. The race is in the town I used to live in, and it was a great home coming. I got to race with two great guys from my old neighborhood. My wife and kids got to help man a water station and the kids got to give me water. Post race beers with old gang. Due to a tragic incident the week before the race the race promoter FIRM Racing decided it would be better/safer if the swim was two laps rather then the one lap they have used in the past. This way if a racer thought they could not complete the swim they could bail after one lap. So, the course went from 1 mile, to what should be ½ mile, but I think winded up being longer. I checked swim times for the top 10 athletes for the past few years and this year’s swim times were approx 30% longer than any other past race. So the swim for me kicked my but, I have a hard time with open water swims. I just get a little freaked out in the dark water, and I just can’t control my heart rate. Toward the end of the first lap I regained my composure and was able to swim like I wanted, and the second lap went fine. I did side and back swim a bit because I needed a break, the longer distance really killed me. Coming out of the water was the best, I made it! I got to T1 and thought where the hell are all the bikes? T1 was 50-70 meters from the swim, and I was able to get in and out in 2:49. Not too bad for me, I did have one issue, I did not dry off enough and my socks got a little wet, and this would haunt me on the run because the wet sock rubbed a whole in the heel. The course was 4 laps of a nice quite loop. I did not ship my bike, but instead I was able to borrow a very nice bike from a friend, who is a super triathlete. It was a nice ride, pretty flat with just a few rollers. So I got on the bike sucked down a gel and a bottle of Gatorade and tried to make some miles. My borrowed bike had aero bars and this was new for me, and I have to say I like them. I liked them so much I just installed a pair last night. Not much here, in and out in 1:51. At T2 I decided to leave my bottle of Gatorade and Hammer gel, I did not think I needed it, big mistake. The only thing on the bike/run course was water, this was bad, and I think that FRIM Racing and the YMCA has to do better next time. With that said in the goody bad was a Hammer gel and packet to sports drink, so they did provide us with something. So without my calories I really felt flat and I had really hard time on the run. Now that’s not to say that the missing nutrition was the reason for the pain but it added to it. Many factors played in to this, my lack of training, I am still a newbie and this was my second ever race, and the longest. I should have checked to see what they would have out on the course for food. I had been sleeping on an air mattress for four nights and had not been able to get regular nights sleep. I am not trying to cop out in anyway, I need to prepare better. This was a learning experience for me, and I took away from this more that I thought I could. I mean to say I am much better racer and person because of it, you really get to see what kind of metal you’re made of. This was a challenge for me, I never thought I could make the swim/bike/run, this was a battle of mind and body, one that I am glad I took. 3 hours 43 minutes and 1 seconds of excitement, tension, anxiety, pain and many other emotions. I am happy with my race. Next Up: Old Colony YMCA Triathlon International distance. For me this is a stretch, I am still a bit of a green horn, I need a few more races under my belt before I can push myself to my limits, that is my rush. I completed the Rock ‘N Roll Sprint Triathlon a little over a month ago, and kept up the training adding mileage. 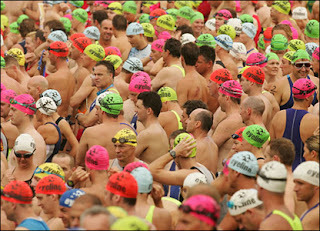 For me the one discipline that I need the most help in is the swim, not because I can shave time off, but because of the open water swim freaks me out. I have been swimming in a pool a few times a week so I am not too worried about the distance, but when I put my face down in the black abyss (I do have flair for the dramatic), Its easy for me to lose my cool. A few times a day I try to picture the swim, the smell, the taste of the water, the temperature, my fellow swimmers, and the colors. This has done so much to relax me, and I know it is helping, so over the next week if I look dazed and I I’m drooling you’ll know what I’m thinking. The bike/run is a 6 mile loop, so I’m sure I’ll be a little board. That’s somewhat of a lie, the pros of a loop is that you get to do it more that once. The first time around you learn, so the second, third … you can hit it with some intelligence, you know where the hills are, you know when you can let it out, and when you reel it in. This isn’t a fun run, it a race and I am ready to do battle with myself and the clock. Today, I swam 1700 meters in the neighborhood pool, I had set up T1 at the pool, so I hopped out of the pool onto the bike and rode 25 miles, then back to the house for T2, then on the 10K run. This was sweet, I had not done the complete distance before and I had some doubts about it, but not anymore. The weather was cloudy and a little dark and not too hot, with a few sprinkles. The swim was nice, not quite open water but at least it was outside, I felt it was somewhere between the lake and the indoor pool I’ve been training in. The bike went great, not too many cars on the road, and the hills were just rollers, the legs felt strong and I had a little left in the tank for the run. The run was good, T2 was at the house so I went inside changed out of my tri shorts and into my running shorts, grabbed my ipod and water bottle and hit the road. I chose bike/run course that was close to what I am going to be racing on next week. So all in all I thought today was the breakthrough day. I had some reservations about the Olympic distance, but after today I am feeling a lot better about it. Got to spend some time with the family that I love so much and we all had fun. 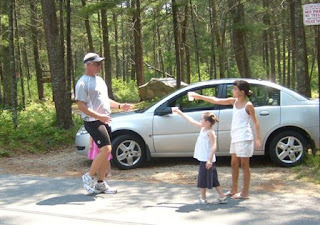 Its Summertime, and I am running the Peach Tree Road Race this 4th of July. I can’t wait, I have been running the distance one or two times a week, so I am not worried about the distance, but I do worry about the HEAT. Wednesday is forecasted be in the lower 90’s, and with all the other runner (55,000 of them) I am sure it will be extreme. I have an 80,000 series number (as I got my app in a day late) so I will be the second to last group to go off. So even before I get to start the elites would of already crossed the finish line. From what I am told I the run is a slow run because of the crowds of walkers, not that anything against walkers, and I am glad that they are doing something, but I do want to run. I will keep updating this blog as the race nears. Please be cautious especially during the first mile of the course. Stay on the main section of the road and off the center medians and sidewalks because they are under construction for the beautification project of Peachtree Road. The safety of all participants is very important to us, so please be alert while running the race. Please enjoy yourself and have a GREAT RUN on the 4th!!! History taken from the Atlanta Track Clubs website. At 7:30 A.M. on what is likely to be a hazy warm morning this coming 4th of July, 55,000 runners in the 38th running of The Atlanta Journal-Constitution Peachtree Road Race will line up from Lenox Square north to the horizon. Over 900 volunteers will help coordinate the start, and it will be a full hour and 15 minutes before the final runner gets a chance to begin his or her 6.2 mile run down Peachtree Road to finish on 10th Street. The Peachtree is the world’s largest 10K road race and arguably the best and most prestigious. The race’s inauguration in 1970 held few indications of such future glory. The idea for a Fourth of July race down the city’s main thoroughfare germinated the year before when a carload of Atlanta Track Club members went to Fort Benning for its modest Independence Day run. On the way home, someone suggested Atlanta should have its own Fourth of July event; another added it could go down the main street given the light holiday traffic. Approximately 110 runners gathered together at the old Sears parking lot at the corner of Peachtree Road and Roswell Road and, at 9:30 a.m. on July 4, 1970, headed downtown towards Central City Park in the first Peachtree Road Race. The race was but one of a series of small, local races put on by the Atlanta Track Club. The club had begun in 1964 when a group of post-collegiate runners joined together with some metro area coaches to support track and field and road running at the local level. The 1960s were the pre-dawn of the running boom; those who ran for exercise were viewed as amusing eccentrics. Road races were small and infrequent, with runners driving long distances to take part in these low-key competitions. To help fill this void, the ATC began a modest series of races in the late 1960s, administered informally and attended by a few stalwarts. Peachtree would become one of this series. The first Peachtree differed somewhat from its companion races, even in the beginning, for it attracted a sponsor, Carling Brewery. That modest support allowed the race to afford trophies, a luxury not easily funded through the $2 entry fee. Nor did the budget include T-shirts though it compassed the 15-cent bus fare given to each finisher to return him back to Peachtree to his car at Sears. Those who ran the inaugural event recall its jovial lack of pretension. Founder and race director, Tim Singleton, put the event on with a handful of volunteers. He, himself, set up registration and started the event. He then jumped in his car, got to the finish well before the lead runners, and oversaw the finish and awards. During the early years, the course went from Sears in Buckhead to Downtown Atlanta. The runners ran down Peachtree’s far right lane, kept close to the gutter by vigilant police. At Pershing Point, the course veered onto West Peachtree, rejoining Peachtree near Davison’s (Macy’s). The race ended at Central City Park. There was no water on the course as track and field rules at the time discouraged such aid for distances 10K or shorter. Spectators consisted of a few surprised pedestrians walking their dogs. Though modest, the race nonetheless attracted the local elite: it was won by Jeff Galloway, to be an Olympian two years later, and Gayle Barron, whose career would be capped with a 1978 win of the Boston Marathon. Despite the heat and lack of pomp and frill, the race caught the imagination of the town’s running community, and of those in the neighboring states. The 1971 Peachtree nearly doubled in size to 198, a growth which took organizers by surprise. That year they used the Carling money to buy T-shirts, but had not ordered enough. They decided to give the shirts to the finishers until they ran out. Those who missed the cut vowed to return the following year and get one. Many did return, though in some cases their luck had not improved. Organizers this time had ordered enough for 250, with the exact design of the year prior, but this time 330 showed up. Close to a hundred left disappointed, promising to return and finally earn the shirt. 1970s following Frank Shorter’s win in the 1972 Olympic Marathon. The name of this new sports hero, coupled with the growing popularity of Dr. Kenneth Cooper’s book on the benefits of aerobic exercise, had thousands buying Nike waffle trainers and hitting the streets. Running was no longer just the activity of the scrawny eccentric. The 1974 event doubled again, to 765 finishers. And, once again, organizers ran out of shirts. In 1975 it fared little better, when over a thousand runners finished. The 1974 and 1975 now carried the name Tuborg rather than Carling but were otherwise unaltered. A major shift took place in 1976, the first major change in the history of the race. Carling, with lessening ties to Atlanta, dropped its sponsorship. The title sponsorship was taken by the Atlanta Journal-Constitution, largely at the instigation of Jim Kennedy, a runner and member of the inner circle of the Cox organization, the newspaper’s owner. Affiliation with the newspaper brought added coverage and corresponding popularity. The race organizers, for their part, began inviting the nation’s elite road racers to participate. The field swelled to 2,300; Olympian Don Kardong won. Peachtree was swiftly becoming among the best known in the United States. But the shirt still looked the same, with the newspaper’s logo replacing that of Tuborg. There was still no date. The large fields were straining race organization. The 6,500 who entered the 1977 race overwhelmed Central City Park. In 1978, the race course was modified. The Start moved north to Lenox Square and the finish line was put in front of the Bath House in Piedmont Park. Runners followed the original course onto West Peachtree. They turned left at 12th Street and then entered the Park towards the Bath House. The 1977 shirt also carried a new look: the familiar peach made its first appearance and as did the date. By 1979, the field had reached over 20,000. The course by now had again been slightly altered, with runners entering the Park at 14th Street. That year, as well, Bob Varsha was hired as the first paid director. In 1980, race entries were limited at 25,000. The limit was set because, at five and half miles, the course narrowed to two lanes where it entered the Park from 14th Street. Organizers felt congestion there was too thick to allow more. Thus race numbers remained until 1990. Though the race limit remained steady, however, interest in the event continued to flourish and the race closed earlier and earlier. In 1989, the 25,000 was reached in just 9 days. Those not making the cut bellowed in anger. Race organizers took heed. The start was redesigned. Time groups of 5,000 each were sent from the start at three minute intervals, allowing the crowd to stretch out sufficiently to ease comfortably through the 14th Street gate. In 1990, 40,000 ran, with a start lasting 30 minutes. The race took two weeks to close. The 1980’s saw other changes as well. In the early part of the decade, the Atlanta Journal-Constitution dropped its sponsorship. It returned in 1985. And later in the decade, in an effort to better meet the needs of children, for whom the Peachtree was both too long and too crowded, the Atlanta Track Club began Peachtree Jr., a fun 3K run for children 7-12. Run the first Saturday in June, it attracts approximately 2000 kids. The decade also saw the emergence of Peachtree’s Wheelchair Division. Presently among the most beloved aspects of the race, the Division took formal shape in 1982. Today, more than 100 athletes take part, in what has become one of the world’s finest wheelchair events, attracting top international competition. Sponsored by the Shepherd Spinal Center since its inception, the event has produced several world record-breaking performances with top contenders covering the 6.2 mile course in under 20 minutes (the course record for those on foot is 27:04). During this period, Peachtree also found its niche in Atlanta’s effort to win the bid to host the 1996 Olympics. Bid organizers invited International Olympic Committee (IOC) organizers to observe the race, and Peachtree’s fourth mile (I-85 overpass to Colony Square) was dubbed the Olympic Mile, complete with salutational banner and Olympic theme music over the sound system. In 1990, Peachtree hosted a breakfast for visiting IOC members along the Mile. In honor of Atlanta’s winning bid, banner and theme music continue there. Continued as well has been the race’s popularity. In 1992, the race expanded to 45,000. That year, it closed in nine days. In 1993, it closed in six days. And for its Silver Anniversary, it attracted 60,000 entries the first weekend it opened. The first 40,000 were accepted, the final 10,000 taken from a lottery of those entries postmarked in March (the race opened March 20). Over 10,000 were rejected. As anticipated, the 1996 running of the Peachtree was memorable. July 4th was but two days before the Olympic Village opened to welcome the 10,000 athletes coming to town to participate in the Centennial Olympic Games. Thirty-two Olympians made Peachtree’s elite field the most illustrious ever; it was little surprise that both men’s and women’s course records fell, the men’s being broken by Kenya’s Joseph Kimani in a world best 10K time of 27:04. The post-Olympic era has little dampened Peachtree’s popularity. When the race opens the third Sunday in March each year, over 60,000 runners routinely vie to enter. In 1998, 55,000 runners were admitted, up from 50,000 in 1997. Among other changes that year as well, all runners who qualified for the early time groups by running a certified 10K in 50 minutes or under were timed, their names listed in the following morning’s Atlanta Journal- Constitution. 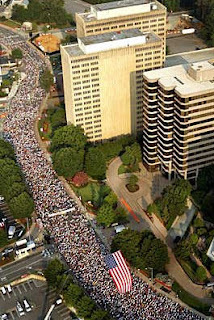 In 1999, Peachtree faced new challenges. Sewer construction in Piedmont Park required the final mile of the course be rerouted; for the first time since 1978 the race finished outside the Park. The new finish, on 10th Street at Charles Allen Drive, is broader and downhill, and has been greeted by runners with enthusiasm. All finish area activity remained in the Piedmont Park meadow, the same as in 1998. In 1999, as well, the race added a new time group Time group 1B, which opened documented placement to all running under 55:00. After a fairly serene 2000 and 2001, major challenges occurred for the 33rd running of the Peachtree in 2002. The meadow area of the park, which the race generally uses for the finish area, was under construction. After long debate on alternatives, the race moved its finish area in the Athletic Fields, a half mile walk through the Park. This constituted altering over 25 years of planning. As usual, the Peachtree Committee and the thousands of volunteers rose to the occasion, making this “Special Edition” a resounding success. Indeed, most enjoyed the cool-down walk through the Park and urged the format be continued. The 34th was similar to the 33rd. The meadow remained under construction, and runners again received their T-shirts at the Athletic Fields. Unfortunately, Hurricane Bill came through three days before the race, leaving the fields sodden, and unable to support the heavy tanker trucks for PowerAde and Crystal Springs water. These were parked on the narrow road overlooking the field, leading to memorable congestion. New touches that year included the introduction of Silver Numbers. Two hundred and fifty randomly selected numbers were replaced by Silver Numbers, qualifying those runners for a special drawing for a trip for two to next May’s Vienna Marathon via Delta Air Lines. The drawing took place from the awards stage following the awards ceremony. Matt Minter of Smyrna was the lucky winner. The 35th running was a major anniversary year and the 110 original finishers were invited back. This in addition, Peachtree hosting its first satellite race: at Camp Victory in Baghdad. Dubbed Time Group Ten-Baghdad Division, 500 soldiers wore Peachtree Road race numbers to earn the 2004 Peachtree T-shirt—a special edition with “Baghdad Division” on its sleeve. The Silver Number drawing was won by Nazeen Desai. Much to everyone’s delight, the renovation of Meadow in Piedmont Park was finished, and could once again welcome Peachtree’s finish area festivities. With the success of Baghdad’s Time Group 10 of the Peachtree, runners in both Kuwait and Afghanistan expressed interest in having their own Peachtree Divisions. In early June, the Atlanta Track Club sent over numbers, special edition T-shirts, and a banner to all three off-site locales. Therefore, in addition to the 55,000 runners in Peachtree-Atlanta, another 750 in Baghdad, 1000 at Camp Arifjan in Kuwait, and 500 at Bagram Air Force Base just outside Kabul earned the 2005 Peachtree T-shirt. Patricia Early of Atlanta was the lucky Silver Number winner on a July Fourth morning that was welcomingly cool and overcast. The 37th running was a very special race for many reasons. It was the 22nd and last year under the excellent leadership and guidance of Julia Emmons, an icon in Atlanta and the sport of running. We also celebrated the 10th anniversary of the 1996 Olympic Games in Atlanta, emphasizing the fifth mile of the race (Brookwood Station to Woodruff Arts Center), with signage and music. The Silver Number drawing sent Rick Young to the Dublin, Ireland Marathon in 2006. This year we will host the USA Men’s 10 km Championship and crown our country’s fastest 10K runner on Independence Day. We will also continue to support the satellite races in Afghanistan, Iraq and Kuwait with an anticipated number of 3,000 military personnel crossing the Peachtree finish line a world away from Atlanta, Georgia. The Silver Number drawing will again conclude the awards ceremony with the lucky winner headed to the Dublin, Ireland Marathon. Not one of the runners who drifted up to Sears for the inaugural run in 1970 could have foreseen he would be among the founding fathers of an event which would, 38 years later, attract well over 55,000 applications in the first few days it opened, four months before the event itself. Nor would have they foreseen the 150,000 spectators, the scores of elite runners from around the world, and the two and half hours of live coverage on TV. One thing they would have understood, however, is how the race represents Atlanta. In 1970, it was a gathering of people from all parts of the City coming together to enjoy their sport and celebrate Independence Day. It still is.